Nageswara Rao's two sons Venkat and actor Nagarjuna and other family members lit the pyre at the Annapurna Studios here, established by the thespian himself. The mortal remains of legendary Telugu actor Akkineni Nageswara Rao were today consigned to flames amid police honours as scores of film personalities, including Union Tourism Minister Chiranjeevi, and fans bade him an emotional farewell. Nageswara Rao's two sons Venkat and actor Nagarjuna and other family members lit the pyre at the Annapurna Studios here, established by the thespian himself. Family members, including his grandchildren who have followed his footsteps in acting, paid their last respects before lighting the funeral pyre. Former Union Minister and Congress leader T Subbirami Reddy, state ministers K V Krishna Reddy, D Nagender, veteran producer D Rama Naidu and popular hero Venkatesh were among those present. Earlier, the body was kept at the film chamber building to enable fans and well wishers to pay their last respects, before being taken back to the Annapurna Studios in a procession, which was followed by thousands of fans and members of the film fraternity. Nageswara Rao, who scaled the peaks of Telugu cinema rivalling N T Rama Rao in stature between 50s and 70s, died here yesterday after losing his battle with cancer. Popularly known as ANR, the 91-year-old thespian mesmerised generations of audiences with a variety of roles and memorable performances in hits like 'Batasari', 'Devadas', 'Prem Nagar', 'Missamma' and 'Tenali Ramakrishna' in a career spanning more than seven decades. 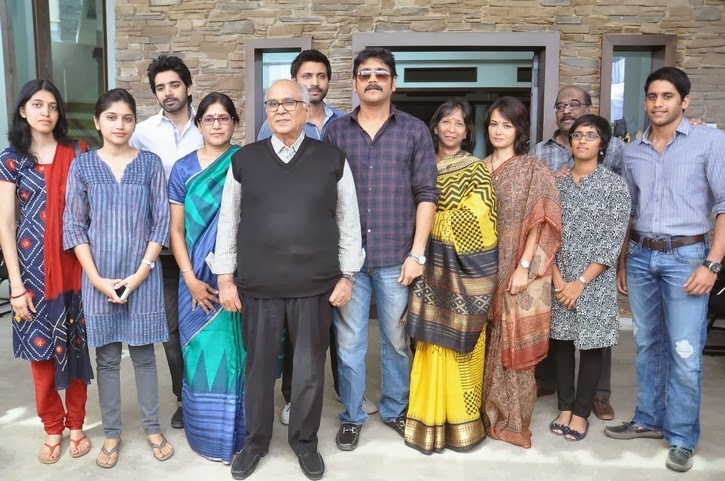 Rao recently completed shooting for his home production 'Manam' (Us) which stars three generations of the family --himself, Nagarjuna and grandson Naga Chaitanya. A Dada Saheb Phalke award winner, he had acted in more than 250 films, including some in Tamil and Hindi. ANR was instrumental in bringing Telugu filmmaking to Hyderabad from Chennai, that was home to film production in all south Indian languages.